This is the third and final disc in Chandos’ survey of Ginastera’s key orchestral works. Volume 1 left me a little underwhelmed, as I found it technically impressive but just lacking a fraction in the sinew and earthy energy that is central to much of this composer's work. Volume 2 featuring the remarkable pianist Xiayin Wang in the 2nd Piano Concerto was a marked improvement and her presence again in two of the three works featured on Volume 3 means that this is again music-making of the highest order. It is often stated that Ginastera’s compositional career falls into three distinct phases; ‘Objective Nationalism’ (1934–1948), ‘Subjective Nationalism’ (1948–1958), and ‘Neo-Expressionism’ (1958–1983) and they chart a gradual move away from an overtly Nationalistic/folk-based style to something more personal although with clear Latin-American roots. By that measure this disc offers us one example from the first phase and two from the third. The disc opens with the Piano Concerto No.1 Op.28. Conductor Juanjo Mena contributes a useful note in the liner where he brilliantly and succinctly describes the opening movement as having “jovial brutality and immense strength”. Ginastera had a remarkable sense of form and a brilliant technical ability to control and manipulate his thematic material. This is instantly evident in the opening to the concerto where a lowering orchestral crescendo introduces the 12-note material of a tone row which the soloist immediately seizes upon in a towering cadenza which is both Lisztian in its virtuosity and power and uncompromisingly contemporary in its musical language. There follows a series of ten brilliantly conceived variations – the following Variaciones Concertantes will show what a master of this form Ginastera is. This music is a considerable challenge for musicians and engineers alike ranging as it does from great slabs of unrelenting orchestral tone to fleetingly elusive dreamlike passagework. Great credit to all involved, then, given the perfect balance that has been found between these extremes. As with the Second Concerto, this idiom seems particularly suited to Wang’s technique and musical sensibilities. She plays with remarkable clarity both musically and technically but also can provide the sheer muscular dynamism when required. The former quality is especially apparent in one of Ginastera’s most haunting and atmospheric pieces of writing; the second movement Scherzo allucinante. This is spectral night-music quite unlike anything else in the repertoire and such is the filigree collage of the writing it is very hard to make it sound effective. One solution as favoured on the Naxos disc of the two numbered piano concerti from Julio Malaval, Dora De Marinis (piano) and the Slovak RSO on Naxos is to play it a lot slower; 6:56 to Mena/Wang’s 4:57. In doing so much of the mercurial malevolence of the music is lost. The third movement starts with a hushed cello solo, but this is soon overwhelmed by a full orchestral cry of pain with the pianist not entering for nearly two minutes. When she does it is with a simple yet meandering passage with a question and answer sequence with the lower strings. Again, both interpretatively and technically this new recording manages the tricky transitions from loud to soft, action to stasis very well indeed. 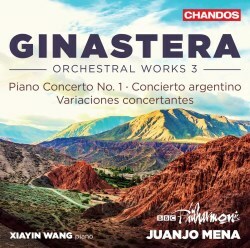 If listeners have been drawn to Ginastera via the posturing machismo of the gaucho dances in Estancia the closing Toccata concertanta is a thrilling, pulsating example of the genre and it receives one of the best performances of this movement I have heard. This is probably the right time to mention the main – perhaps only – serious competition in the current catalogue for the two concertante works recorded here. Pianist Barbara Nissman's name is irrevocably linked to Ginastera's music. He dedicated his final work - the Piano Sonata No.3 - to her, she was responsible for discovering and reintroducing to the concert hall the Concierto argentino as well as editing both the 2nd Concerto and the 2nd and 3rd Sonatas for publication. She performed all three concerti on one evening with the University of Michigan SO conducted by Kenneth Keisler. A recording of this is available on the Pierian label. For sure this student orchestra are not as polished as their BBC counterparts on this new disc but both their playing and the recording is very good indeed. And the presence of Nissman in superb form too makes that disc an obligatory purchase for all Ginastera acolytes. Loathe as I am to have to choose between the two performances, if really pushed the extra polish and sophistication of this new disc allied to Wang's formidable skill would just tip the balance in favour of Chandos - but of course, that choice does require the purchase of another disc to hear Wang and Mena in the 2nd Concerto. Instead of that concerto, the new disc offers one of Ginastera’s most brilliant orchestral achievements; the Variaciones concertantes for chamber orchestra. Think a kind of ‘Latin American Guide to the Orchestra’. Ginastera’s original theme is then treated to a series of Interludes and Variations of distinctly varying character but, more importantly, featuring or being led, by a different solo instrument within the chamber orchestra. The common thread is that these are very demanding indeed for the solo players and indeed the orchestra as a whole. Unlike the piled-up textures of some of his other works, this is a model of transparent and skilful scoring – all of which the Chandos recording makes very clear. No surprise that the calibre of the solos taken by the principals of the BBC Philharmonic is very high - the only shame being that none of them except the leader is actually named, unlike a version issued as part of the too-short-lived RPO/Tring label which is an excellent version of the work both musically and technically. In fact, in parts I prefer that version to the current one. These Variaciones are pretty well served on disc and in the main all of the other versions I know are pretty good. I am not as keen on the LSO/Ben-Or version which has been re-released on Naxos which is efficient rather than inspired. Another neat but somehow too polite version comes from the Staatsphilharmonie Rheinland-Pfalz on Capriccio - the main interest in that disc is the inclusion of an orchestral suite from Ginastera’s opera Bomarzo. A very good version of the variations comes from the Orquesta Ciudad de Granada and Josep Pons on Harmonia Mundi. Pons finds a great deal of colour and wit in the scoring and the Harmonia Mundi recording is less obviously detailed than the Chandos but has a more natural perspective – you notice how close some of the Chandos microphones are when the flute keys in that instrument’s variation are very audible. Pons is one of the few other conductors alongside Mena on the new disc to set an exhilarating tempo for the closing Variazione finale, but no other disc except Pons captures Ginastera’s colourful orchestration with whooping horns and brass. Possibly Chandos have kept the best until last. The disc closes with the ridiculously precocious Concierto argentino. As alluded to before, this was the work rediscovered and returned to the repertoire by Barbara Nissman. Apart from the Nissman recording mentioned above – which, to reiterate every Ginastera admirer will want to have in their collection, as far as I am aware this is the only alternative performance and as such can be considered the first fully professional recording. This is the young composer in full-flood, revelling in his own compositional fluency as well as the barely digested influences of everything from Argentinian folk-music to modernistic orchestration and even the occasional bit of Gershwinian flamboyance. As the liner put it; “the major attraction of [it] is its reckless, youthful exuberance, its disregard for good taste and academic correctness”. By the time Ginastera came to write his true Op.1, Panambi, he had reined in most if not all of those musical excesses, but at the same time what is remarkable is how many musical fingerprints are retained by the composer in his later works. Pulsating rhythms are the immediate and obvious one with cross-accenting and changes of meter rarely allowing the music to settle into the predictable. In each of the three movements Wang is slightly quicker than Nissman and remarkably good though the Michigan University players are, it would be hard not to hear this new version as altogether more sophisticated and polished than its predecessor. Not that sophistication and polish are in any way prerequisites of this style of music, but there is greater variation and colour both in the performance of this new disc and how it has been captured by the engineers. Again, Wang is mightily impressive; I like very much the way she can switch from the passages of swooning neo-Hollywood to edgy Malambo-esque rhythms in an instant. The central Adagietto poetico is a beautiful piece of writing and scoring for someone still in their teens and again Wang finds exactly the right gently-swaying sensuality in her playing which keeps the music flowing and beautifully expressive without ever descending into empty gesture. The closing Allegro rustico brings both this disc and the mini-set of performances to a suitably rumbustious and celebratory close. This is quite possibly the first of Ginastera’s compound-time finales which whirl along in an exhausting perpetuum mobile, although here he does nearly get diverted into a big Hollywood finish. Fortunately, his Argentinian roots haul him back to a wrong-note-packed 6/8-3/4 Presto conclusion played with the ideal combination of technical security and musical abandon by Wang and the BBC PO. I have enjoyed all three volumes of this series on Chandos and in fact I think they have got better with each succeeding disc. Wang’s versions of the three concerti are now the finest in the catalogue with the Concierto argentino a delight. The Variaciones receive a fine recording which is very good in its own right without displacing either Pons on Harmonia or Enrique Arturo Diemecke with the RPO on Tring – the latter can still be found via the usual 2nd hand/marketplace retailers online. Presentation is up to the usual Chandos high standards: this is a ‘normal’ 24-bit recording and the liner is presented in the usual tri-lingual format. Xiayin Wang's discography continues to grow in quantity and quality with both concerti here showcasing her technical and musical brilliance. Further proof if any more were needed of the richness and quality of classical music from Latin America.